At 1,345 feet (410 meters) above sea level, Conor Pass is the highest mountain pass in Ireland and one of the country’s most scenic drives. The narrow, twisting road weaves its way through steep cliffs, offering spectacular views of the glaciated landscapes, mountains, lakes, waterfalls, and the coast. Starting from Dingle Town, the road rises 1,500 feet (457 meters) as it approaches the pass. There is a parking lot at the highest point where you can stop and admire the views of the coast. Then as you continue along the road, you will pass Brandon Bay and more cliffs, waterfalls, and lakes. The road also crosses the Brandon Mountains, home to Ireland's second-highest peak, Brandon Mountain, at 3,217 feet (980 meters) high. Guided sightseeing tours around the Dingle Peninsula typically take the Conor Pass as part of the journey along the Slea Head Drive, as well as sites of interest such as Ferriter's Cove, Gallarus Oratory, and the villages of Castlegregory and Dunquin. Driving Conor Pass is a must-do for some of the most scenic views in Ireland. Length and weight restrictions prohibit certain vehicles, such as camper vans and trucks, from using the pass. Due to its many twists and turns, driving the pass is not recommended in bad weather. Conor Pass is on the Dingle Peninsula in southwestern Ireland, along the road that runs from Dingle on the southern end of the peninsula toward Brandon Bay and Castlegregory. Driving from Dingle Town, it will take you about 10 minutes to reach the pass. The road is typically open all year but can close during winter due to inclement weather or if the snow has not been cleared. 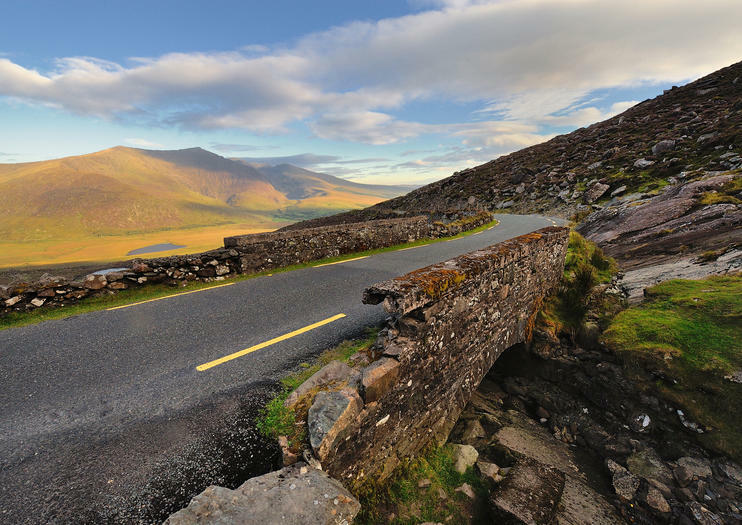 Like many of the roads around the Dingle Peninsula, Conor Pass is often choked with tourists at the height of summer. Visiting in spring or fall promises fewer crowds. The steep bicycle ascent of the pass is one of the most famous and challenging climbs in Ireland. Only around 3 miles (5 kilometers) long, it nevertheless has an average 6-degree gradient, which gives an idea of its difficulty—especially if it is windy, as is often the case. Discover famous landmarks and hidden gems on the Emerald Isle on this private tour of the Dingle Peninsula from Killarney. Explore the Dingle Peninsula with your private guide and take in top attractions including Ferriter's Cove, the Gallarus Oratory and the Blasket Centre. Pass pretty villages and towns such as Annascaul, Castlegregory, Dingle and Dunquin, where life ticks by at an altogether slower pace. Admire fine views over the mighty Slieve Mish Mountains and Mount Brandon — one of Ireland’s highest peaks — and take the famous Connor Pass back to Killarney.